Maximum size: 17 mm (extrapolated from shell length). 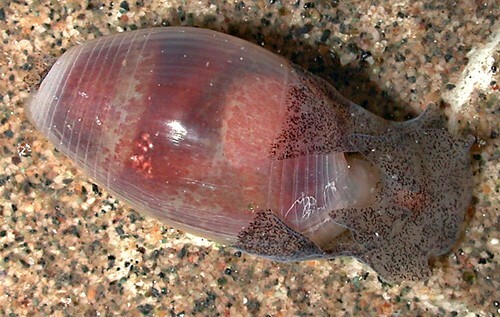 Identification: This species has a transparent shell with crisp spiral striae on the apex and base. The shell is widest below the midline. The animal is translucent cream with brown flecks on the head and parapodia. Pink spots show through the shell and increase in prominence with age. It may be distinguished from young Atys kuhnsi by the shell profile, lack of striae on the center of the shell when mature and smaller eye spots. Natural history: Atys semistriatus is one of the most common haminoeids in Hawaii. It is found in rocky and mixed habitats from < 1 to 29 m (< 3 to 95 ft) but is only occasionally found in Halimeda kanaloana beds. It occurs in protected to exposed sites and is nocturnal in habit, concealing itself under rocks or in underlying sand during the day. When the population is high, mating aggregations with copulating pairs can often be seen on top of coral rubble or rocks at night. It lays a spherical, white to pale pink egg mass that is usually anchored in algal turf in the field. Distribution: Big Island, Maui, Oahu, Kauai, Niihau, French Frigate Shoals, Laysan, Lisianski, Pearl & Hermes Reef, Midway and Kure: widely distributed in the Indo-Pacific. Taxonomic notes: This species is listed as Atys semistriata in Kay, 1979 and Kay & Schoenberg-Dole, 1991. However, the photo in Kay & Schoenberg-Dole, 1991 is probably Atys kuhnsi, instead. It was first reported from Hawaii in Pease, 1860. Atys semistriata mua Pilsbry, 1921 and Atys semistriata fordinsulae Pilsbry, 1921 are synonyms (Kay, 1979). Photo: CP: Hekili Point, Maui; Oct. 30, 2004.